After years of wondering about an unidentified photograph from Deadwood in my family’s collection, a second photograph of the same couple turned up in the collection of an extended family member. In my mind, while just one might have come from, say, a neighbor who had gone off to the Wild West and wished to be remembered to those back in southeastern South Dakota, where this branch of my family lived, two suggest that this couple may actually have had a closer connection to my family. Were they friends, or were they relatives? 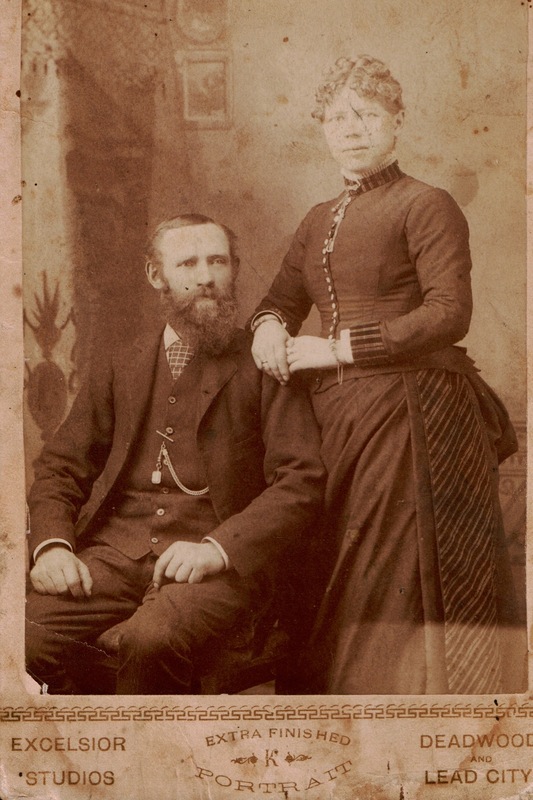 Unidentified couple, Deadwood or Lead City, Dakota Territory, ca. 1884-1890; digital image 2013, privately held by [personal information withheld], 2014. In the first photograph, a couple poses for what could be a wedding portrait, as the woman arranges her hands in such a way that a ring is visible along with two bracelets. The man has a distinctive high forehead, large ears, and a long beard. He wears a dark three-piece suit and a plaid tie. The woman has a broad face and light-colored eyes; her hair is curled at the temples and arranged in a looped braid at the back, a style that became popular in the 1870s.1 She is corseted and wears what looks to be a heavy gown, with a high collar and bustle. A single row of buttons adorns her bodice, and matching patterned material is visible at her collar, cuffs, and on a unique side panel of her skirt. 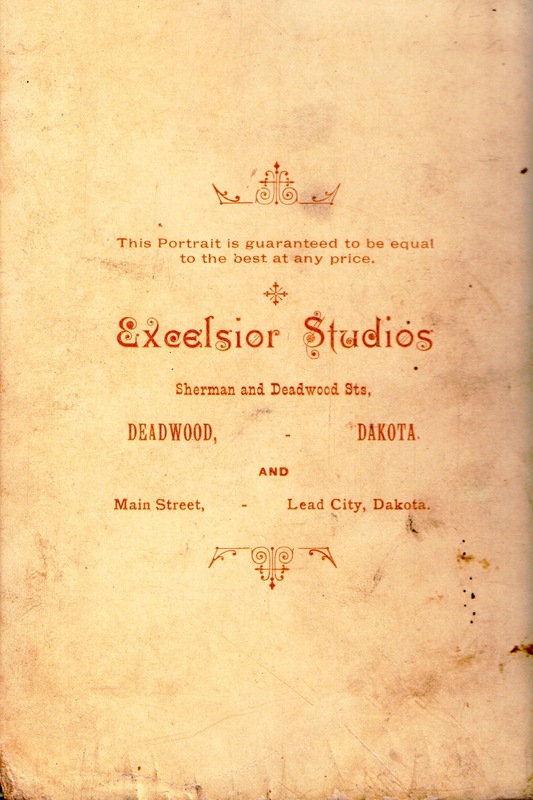 According to the information stamped on this cabinet card, it was made at Excelsior Studios, located either in Deadwood or Lead City, Dakota. Deadwood and Lead were founded in 1876 during the Black Hills Gold Rush, and the place name “Dakota” suggests that the portrait was made before (or immediately after) South Dakota achieved statehood in 1889. Thus, an initial time span for this photograph, as well as the one to follow, can be set at 1876-1890. 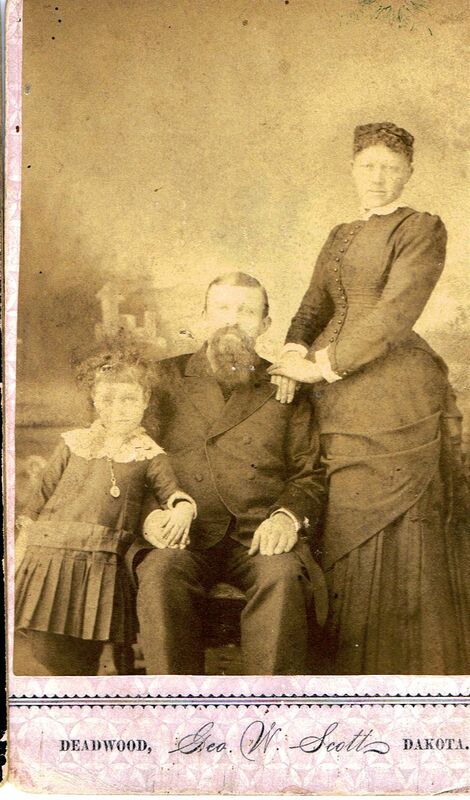 Unidentified family, Deadwood, Dakota Territory, ca. 1883-1887; digital image 2010, privately held by Melanie Frick, 2014. The second photograph seems to feature the same couple, although at a different time; the woman appears more slender and has styled her hair differently, and, of course, she and her husband both wear different clothes. This time, a young girl joins them in the photograph, most certainly their daughter. She looks to be about five or six years old; while standing next to her seated father, she places her hand over her his and leans back against his shoulder. Her dropped waist dress falls to her knees with a pleated skirt, belt, and a fancy collar. Her mother again wears a row of buttons on her bodice, and her draped overskirt over knife pleats was of a style popular in the mid-1880s.3 In many ways, her dress is similar in style to that of the previous photograph. Initially, I wanted to date the photograph of the couple alone before that of the couple with their child; however, the dates of operation of the Deadwood photography studios suggest that the reverse may also have been true. Perhaps it was not a wedding portrait after all! In any case, for a child of five or six to have been photographed by Scott in Deadwood between the years of 1883 and 1887, a birth date of somewhere between 1877 and 1881 can be assumed. This provides an essential clue. The next step is to learn whether any of my direct ancestors had kin who lived in or near Deadwood. If a couple had a daughter between roughly 1877 and 1881, who happened to be the only child in their household at some point between 1883 and 1887, then that would make them strong contenders for the individuals featured in these photographs. Whoever they may be, I imagine that they must have had interesting stories to tell about life in Deadwood’s first decade! 1 Maureen Taylor, Fashionable Folks: Hairstyles 1840-1900 (United States: Picture Perfect Press, 2009), 85. 2 Deadwood Photographers (http://deadwoodphotographers.blogspot.com/ : accessed 20 March 2014), entry for Charles L. Kersting. 3 Joan Severa, Dressed for the Photographer: Ordinary Americans and Fashion, 1840-1900 (Kent, Ohio: Kent State University Press, 1997), 418. 4 “Biographies,” Fremont County, Wyoming Genealogy and History (http://genealogytrails.com/wyo/fremont/fremontbios3.htm : accessed 20 March 2014), entry for George W. Scott. 5 Deadwood Photographers (http://deadwoodphotographers.blogspot.com/ : accessed 20 March 2014), entry for George W. Scott. This entry was posted in Photograph Analysis and tagged 1880s, Dakota Territory, Deadwood, family history, genealogy, South Dakota, unidentified photograph on March 21, 2014 by Melanie Frick. Wow! What great photos. And your analysis of them is impressive. I was drawn to your blog because I have a similar situation about Deadwood. To be brief, I recently came across a diary among my family’s memorabilia that had belonged to John Boyer, the husband of my great-great-great grandmother, Lizzie Boyer (her second marriage). He was a carpenter. And they moved to Deadwood from Iowa not long after the 1879 fire which destroyed most of the town. I imagine they moved there because of the potential work for a carpenter rebuilding the town. The diary is from 1881 and John wrote in it every day, mostly documenting weather, his work, travels, purchases, expenses, etc., along with his frequent walks with Lizzie around Deadwood. It isn’t all that eventful, but it provides a glimpse of what life was like in Deadwood in 1881. According to census records they lived in Deadwood until sometime after 1900 when they moved to Lead where John was employed by the Homestake mine. John died in 1921. He is buried in the Lead cemetery. Lizzie moved to Los Angeles to join her daughter and her grandchildren and their families (of which I am descended). Lizzie died in 1930 and is buried in an unmarked grave in Inglewood, California. The diary is very fragile at 133 years of age. However, carefully, I just finished scanning it yesterday. I am about to undertake the task of transcribing it. I was hoping that your photos might be John and Lizzie. We don’t have any photos of John. But we do have some of Lizzie as early as 1905. And there doesn’t seem to be any resemblance between Lizzie and the woman in the photos. However, Lizzie’s only surviving daughter, Priscilla, lived with John and Lizzie in Deadwood from 1880 until 1882 (her husband was a millwright who traveled between Nebraska, Kansas, eastern Colorado, D.T., and Iowa). And Priscilla had a daughter, Dorothy, born in Deadwood in 1881. But I think Priscilla and Dorothy left Deadwood by 1882 or 1883 to return to Iowa, because she had a son, my grandfather Perry, born in Newell in 1884. Anyway, thank you for sharing this. If you are interested in discussing this further I’d be glad to share more.